What grand "Kingdom dreams" do you have for God's glory? What incredible ideas can you imagine requesting that God would bring to fruition? What are your expectations of heaven with God? Now that you have stretched mind, challenged your imagination, and loaded up your expectations, are you ready for some down to earth truth straight from the Marvel of heaven? 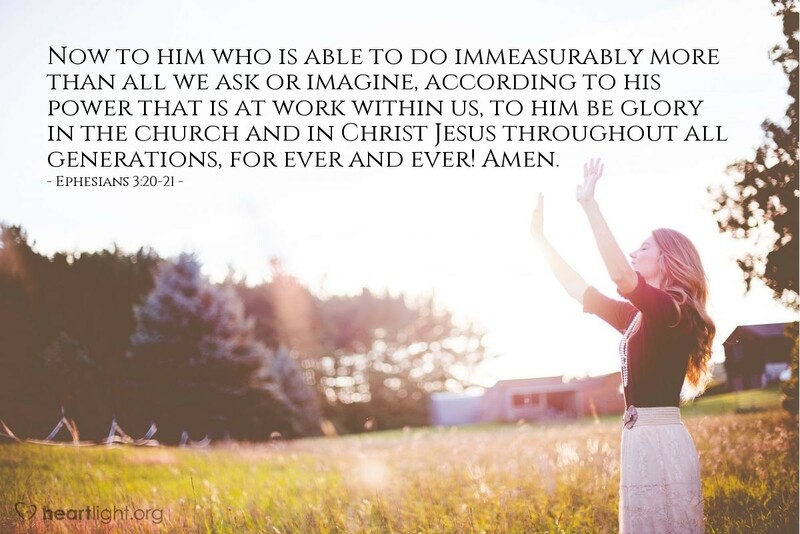 God is able to do far more than any of that. His power is at work in us to do his glorious will and accomplish his eternal purposes. So let's not set our sights too low and expect too little. Live for his glory and expect to see it at work in your life. O LORD, God of heavens and earth, my Abba Father and loving Shepherd, please stir my thoughts by your Spirit to dream bigger dreams and have higher hopes than my earthbound and selfish brain can imagine. Give me a sense of wonder and expectation as I live for your glory. In Jesus name I pray. Amen.